Do your field people have the level of support that justifies the cost of drilling? 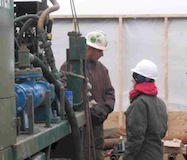 Do their drillers have the tools and experience that warrants spending multiple thousands of dollars each day?... We do, and we feel confident making that statement. After twenty five years of hard work, Geologic has assembled a crop of drilling foremen with the most extensive collection of experience in the Northeastern United States. GeoLogic specializes in drilling in areas other companies don’t have the expertise or the equipment to reach. We are known for our ability to work with engineers and other contractors to coordinate resources in a way that spells success on the most complicated projects. 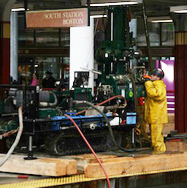 The photo above shows one of Geo’s machines drilling deep into the Cambridge Argillite through the passenger platform at Boston’s South Station. 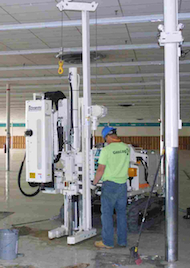 GeoLogic has numerous drills equipped to work under low clearance restrictions. Drilling with specialized machines equipped to operate with full torque and a conventional 5 foot stroke in restricted overhead areas, typically as low as about eight feet vertical clearance opens an entirely new world of options to our clients. 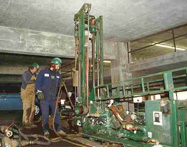 Test borings, whether environmental or geotechnical are seldom located in a convenient place. Probably because it is easier, some drilling contractors prefer to limit their operations to locations where access is straightforward. At GeoLogic, we prefer to find new ways to work with scientists to allow boreholes to be placed where they are needed. GeoLogic has been involved in environmental drilling since the early days of many federal Superfund projects and through the genesis of the MGL CH. 21E program in Massachusetts and its analogues in the surrounding New England states. 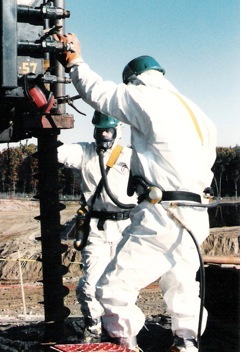 Having made an early investment in the equipment and training to safely work on environmental sites at various levels, Geo was instrumental in pushing the developmental envelope in technical drilling areas including some of the early isolated zone groundwater sampling in soil and bedrock. GeoLogic has one of the most extensive, yet safest marine drilling resumes in the New England. 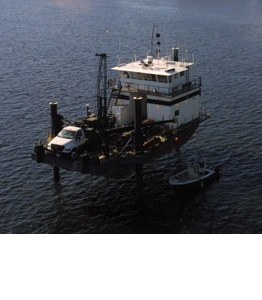 Whether drilling to depths nearing 400 feet in high- head artesian conditions, working in strong currents, or in the intertidal zone during winter conditions. Geo has the knowledge and depth of experience to work to success through some of the more difficult conditions Father Neptune cares to provide us. Whether on inland rivers with high current, or exposed ocean fetches. Geo brings the resources to bear to complete projects safely, on time and on budget. With various sized, limited access to full sized rubber track mounted probes, GeoLogic employs Geoprobe® equipment for vibratory probe work as stand alone projects, or to complement our traditional drilling programs. 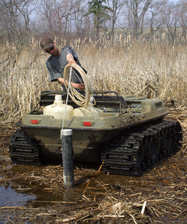 The probes allow us to use Geoprobe’s time tested tooling for environmental sampling, profiling and remediation. "Geologic and their representatives perform their work in a very professional manner. In addition their work is completed on time in a well coordinated effort considering the environment, neighbors and client."